Centered Riding® was developed by founder Sally Swift as a way of connecting the mind, center and body in riding. Use of the Centered Riding basics helps all riders to use their bodies correctly and more effectively. Horses respond by becoming more responsive, better balanced and more relaxed, allowing them to perform with greater freedom of movement. The techniques of Centered Riding can be applied to any discipline, and will improve your overall comfort, confidence and communication with your horse. Centered Riding® offers an innovative way of expressing the classical principles of riding, using body awareness, centering, and imagery. Centered Riding® encompasses all seats and styles of riding. It teaches a language that allows clearer communication between horse, rider, and instructor. Centered Riding® is now taught by Centered Riding Instructors around the world. Centered Riding® is based on a knowledge of human and horse anatomy, balance, movement, and on understanding how the mind affects the body and how both affect the horse. It uses centering and grounding techniques from the oriental martial arts, along with body awareness, mental imagery and sports psychology. Through increasing body awareness, inhibiting old patterns, and replacing them with a more balanced, free, and coordinated use of self, both horse and rider can move more freely and comfortably, and develop their best performance. Breathing – Using the diaphragm and breathing correctly for better posture, relaxation, and energy. Balance or Building Blocks – Aligns the riders body for improved balance, straightness, and ease of movement. Centering – Using the center of balance, movement and control, located deep in the body, gives quiet strength, harmony and power, as in the oriental martial arts. These fundamentals, along with clear intent for effective control, direction and use of aids, and grounding for stability and balance, promote freedom of movement, confidence and harmony between horse and rider, and can help in solving many problems. Bodywork is included in Centered Riding Clinics to help participants relax into proper alignment. Centered Riding® teaches you how to help your body do what you need to do in order to ride well. Centered Riding® techniques help promote suppleness, stability, and clearer aids, making riding more comfortable for both horse and rider. As you learn and experience the principles through your horse’s motion and responses, you and your horse tune in to each other and work together in harmony. These techniques can increase confidence and enjoyment and release tension in horses and riders, making training easier. They also help people cope with old injuries or chronic conditions that cause pain during or after riding. 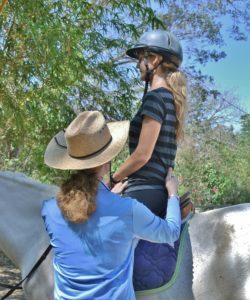 Centered Riding® is used successfully by riders and instructors of all ages, interests, and levels, from pleasure riders to international competitors, and in therapeutic riding. It can be applied to any type of horse or horsemanship. Most of all, it makes riding more enjoyable for horses and riders. Listen to Rick Lamb’s 1997 interview with Sally Swift, in which he talks with Sally about her life and the Centered Riding concepts. Rick calls this his all-time favorite interview on the Horse Show. 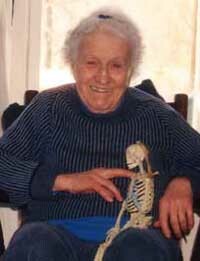 Sally Swift with her teaching partner Herman. Heidi Potter is 1 of 33 Level III Centered Riding Instructors/Clinicians in the world and 1 of 15 in the United States. Heidi studied under Sally Swift, the founder of Centered Riding, as well as with several other Level IV Centered Riding Instructors. She credits them with much of her knowledge and continues to learn from them on a regular basis. The Centered Riding (CR) methods are primarily based on Martial Arts philosophies and the Alexander Technique. The Alexander Technique addresses a person’s posture and movement. It teaches how to re-educate the mind and body towards greater balance and integration. Centered Riding serves as the foundation for Heidi’s In Harmony With Horses program. She states that, “Centering and Balance, along with Grounding are all essential to keeping riders safe, relaxed, and effective in all they do with horses.” Using these basics help enable horses and humans to achieve greater harmony, clearer communication and to work together in a most natural way. Click here for information about hosting a Centered Riding Clinic. Options include open clinics – for riders of any level or discipline, or a clinic tailored to a specific discipline or skill.